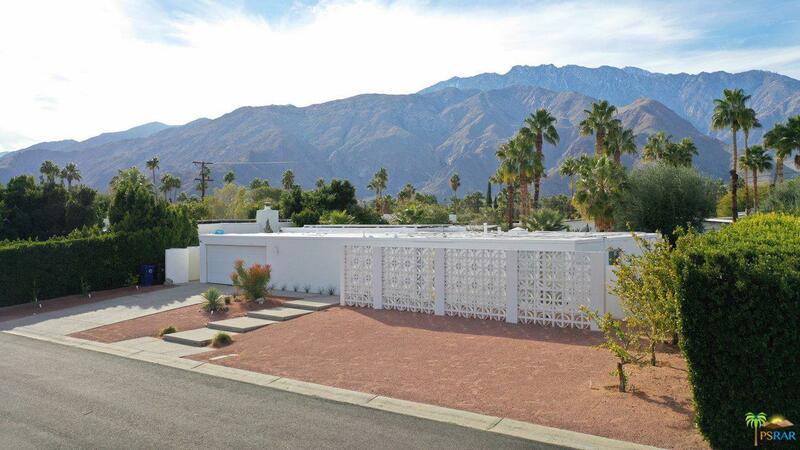 Stunning mid-century Alexander home in the heart of Racquet Club Estates. Designed by Palmer and Krisel, this home has been completely remodeled with all the modern day conveniences. Enjoy the amazing mountain views while splashing in the resort style salt water pool/spa. Invite your friends over and entertain in the well appointed designer kitchen w/stainless appliances, custom cabinets and ceasarstone countertops. Additional upgrades include terrazzo flooring, insulated foam roof, copper plumbing, electrical upgrades, new heat/ac, water heater, dual pane energy efficient windows and remodeled spa-inspired luxurious bathrooms and so much more. Close to town where you will find all the night life, restaurants and galleries you could ask for. Your desert dream awaits you. Sold by Matthew Reader BRE#01930656 of The Paul Kaplan Group Inc. Listing provided courtesy of Team Michael Slate DRE#01930656 of The Paul Kaplan Group Inc.